Each sea turtle has their own unique arrangement of scales on their head and flippers (like a fingerprint), so they can be monitored over time simply by photographing them. This is a very non-invasive way of learning a lot about them. Some have only been seen once, but we have “known” many of these hawksbills for years. You can learn about each one by clicking on their name (coming soon). You will significantly contribute to this research by emailing your photographs directly, or by sending us links to online sightings (social media or other websites you come across). They can swim between islands so be sure to compare them all. The same turtle has different scale arrangements on its right and left profiles, and all flipper patterns are different. Different colorations or injuries that may heal should not be used when matching hawksbills, as they often change over time. The quality and angle of the photo distorts the shapes of the scales, so it's best to compare as many parts of the turtles as possible. In some cases, perfect photos from all of the angles (right and left profiles and all flippers plus the top of the head) of every hawksbill don't exist, so some individuals simply can't be compared. Size is often difficult to confirm. Turtles grow, so can change from juvenile to adult categories (and adult males' tails may appear later). 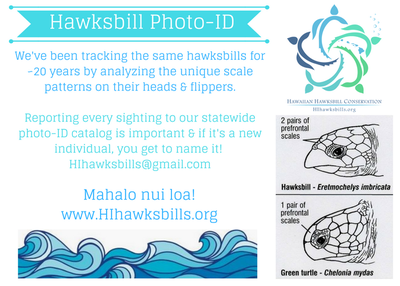 Comparing hawksbills is more difficult than greens, as Hawaiian hawksbill facial scale patterns are often similar and their scales are less defined. Therefore, matches are only confirmed 100% when multiple patterns are shown to be the same. Good luck, have fun and please let me know who you discover! send us a hawaiian hawksbill sighting! ​If your sighting is confirmed to be a new hawksbill to the catalog, you get the opportunity to name it! You will always receive photo credit if your photo is used. Your name will be listed under the "Sighted By" category in each hawksbill's profile that you submit photos of. 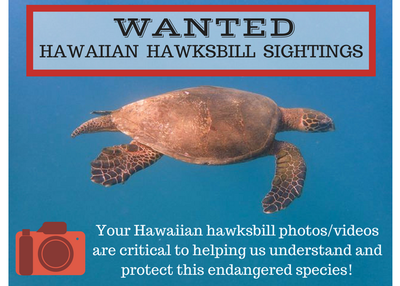 You can choose to receive our "Hawaiian Hawksbill Happenings" e-newsletters to keep you up-to-date, or just be contacted if your hawksbill is re-sighted. • I started this fascinating project in the year 2000, when I saw my first Hawaiian hawksbill, and have been searching for more ever since. 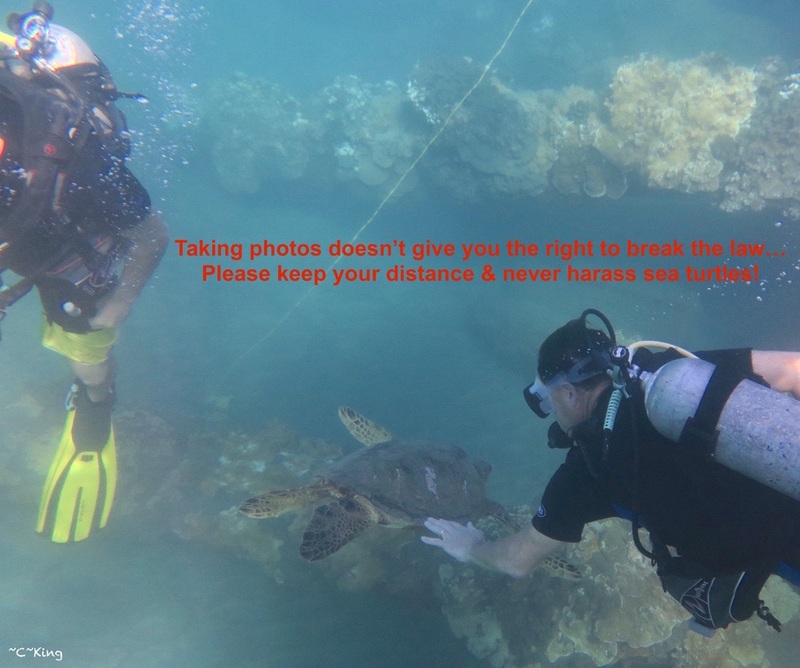 • See the "Meet the Turtles" island-specific pages for complete information, but most of the sightings are from Maui (where I live). • Our "Hawaiian Hawksbill Hui" is a statewide network of government agencies, conservation NGOs plus concerned community members. Join us! • I can't thank everyone enough for contributing so much to this project over the years! Out of respect for these photographers, please ask permission before using any images or data on this site. Want to help spread the word about hawksbills?